With the significant rise in the packaging industry across the world, the global market for aluminum barrier laminate tubes has witnessed a tremendous surge in its valuation and size. Aluminum barrier laminate tubes are majorly utilized for the packaging of various consumer goods, such as premium dental creams, antiseptics, oils, and adhesives, worldwide. These tubes are apt for food products as well. As the demand for premium consumer goods is increasing substantially, the market for aluminum barrier laminate tubes is expected to witness a noticeable growth, globally, in the years to come. By 2017, the worldwide aluminum barrier laminate tubes market is anticipated to offer an opportunity worth US$772.3 mn. It is expected to rise further at a CAGR of 5.50% between 2017 and 2022 and attain a value of US$1.01 bn by the end of 2022. The rising awareness among consumers regarding the eco-friendliness of aluminum barrier laminate tubes when compared to ordinary plastic tubes is also expected to boost their demand in the near future, reflecting greatly on this market. In general, the global aluminum barrier laminate tubes market is evaluated on the basis of the capacity, type of the cap, and the end users. In terms of capacity, the market is classified into less than 50 ml, 50 to 100 ml, 101 to 150 ml, and above 150 ml. Among these, the most prominent segment in this market is the 50 to 100 ml segment, which is likely to remain on the top over the next few years. Stand-up cap, fez cap, nozzle cap, and flip top cap are the main segments of this market on the basis of the type of the cap and the cosmetics, commercial, oral care, home and other personal care, pharmaceuticals, and the food industries are the prime end user of aluminum barrier laminate tubes. The Middle East and Africa (MEA), Asia Pacific excluding Japan (APEJ), Latin America, North America, Europe, and Japan are the prime regional markets for aluminum barrier laminate tubes across the world. Of these, Europe has surfaced as the leading contributor to the global market for aluminum barrier laminate tubes, thanks to the high disposable income of people in this region that allow them to spend on expensive premium consumer products. Expanding at a CAGR of 5.50% over the period of 2017–2022, the Europe market for aluminum barrier laminate tubes will continue to lead the global market over the next few years. 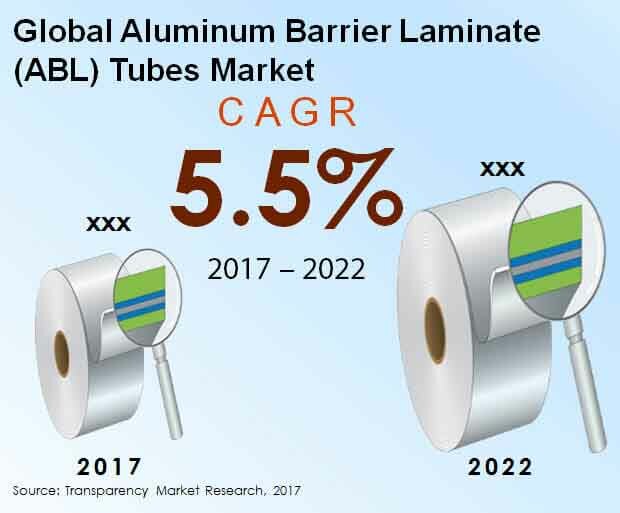 North America is also expected to register a steady growth in its market for aluminum barrier laminate tubes in the near future on the grounds of the presence of a large pool of aluminum barrier laminate tube vendors. This regional market is expected to report a CAGR of 4.70% between 2017 and 2022. Among other regional markets, Asia Pacific excluding Japan is anticipated to register a promising future, proliferating at a CAGR of 6.50% during the period from 2017 to 2022. Other regional markets are also projected to witness an increase in the demand for aluminum barrier laminate tubes in the years to come. Ambertube International, Essel Propack Ltd., Pirlo GmbH & Co. KG, Montebello Packaging Inc., Hoffmann Neopac AG, Linhardt GmbH & Co. KG, Impact International Pty. Ltd., Huhtamaki Oyj, Tubapack S.A., and Intrapac International Corp. are some the leading players functioning in the global aluminum barrier laminate (ABL) tubes market. In the recent times, the global market for aluminum barrier laminate tubes has witnessed a remarkable rise in its valuation, thanks to the substantial rise in the packaging industry across the world. The augmenting demand for premium consumer products is adding significantly to this market and is expected to continue doing so over the next few years. This research report offers a strategic analysis of the global market for aluminum barrier laminate tubes and the growth forecast for the period 2017 to 2022. To assist in proper decision-making, the report includes a detailed review of top participants in this market, their respective market share, their business strategies, and the recent developments in their businesses. The analysis of the key trends and the market opportunity map presented in this study discusses several imminent trends in the end-use industries that may fuel he demand for aluminum barrier laminate tubes in the coming years. Apart from this, the scope of this research report also focuses on the future potential of various imminent products in this market. The market attractiveness analysis and the opportunity map provided here offers deep insights into various market dynamics and the competition between the leading players, along with providing the most profitable segments within the global aluminum barrier laminate (ABL) tubes market. The research report also presents the breakdown and the assessment of various factors, such as market drivers, restraints, and opportunities that influence the growth of the global market for aluminum barrier laminate tubes. These factors determine the prominent trends and their effect on the overall market growth. On the whole, after considering various important factors, which influences the global aluminum barrier laminate (ABL) tubes market, the research report also provides an estimation of growth for the forecast period during 2017 to 2022. Under the scope of this research report, the global aluminum barrier laminate (ABL) tubes market has been assessed on the basis of the capacity, type of cap, and end user. In terms of capacity, the market is classified into less than 50 ml, 50 to 100 ml, 101 to 150 ml, and above 150 ml. Stand-up cap, fez cap, nozzle cap, and flip top cap are the main segments of this market on the basis of the type of the cap and the cosmetics, commercial, oral care, home and other personal care, pharmaceuticals, and the food industries are the prime end user of aluminum barrier laminate tubes. Each of these segments have been provided with the market size and the forecast for the period 2017–2022, further emphasizing on the prominent trends, which act as influencing factors for each of the application segments. The analysis of aluminum barrier laminate (ABL) tubes market on the basis of the region offers an in-depth assessment of the current trends in the regional markets for aluminum barrier laminate tubes. As per the research study, the aluminum barrier laminate (ABL) tubes market has been geographically divided into North America, Asia Pacific excluding Japan (APEJ), Japan, Europe, Latin America, and the Middle East and Africa (MEA). Various performance of the protein supplement market in various countries under each of the regions has also been evaluated in this research report. Some of the leading players functioning in the global aluminum barrier laminate (ABL) tubes market across the world are Ambertube International, Essel Propack Ltd., Pirlo GmbH & Co. KG, Montebello Packaging Inc., Hoffmann Neopac AG, Linhardt GmbH & Co. KG, Impact International Pty. Ltd., Huhtamaki Oyj, Tubapack S.A., and Intrapac International Corp.